All our foot treatments are performed in private rooms dedicated sole-ly (pardon the pun!) to Pedicures. The skin on our feet continually takes a battering and is so often neglected. When our feet are tired and achy our whole body and mood are affected. Hard working feet need special care when it comes to keeping them looking and feeling fabulous. Pedicures are fantastic for the most neglected of feet and will be brought back to life with the wonderful, restorative benefits of a Pedicure. We only use the best product available in our treatments. 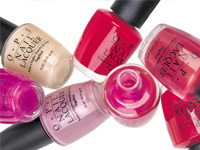 OPI™ is the world’s leader in professional foot beauty and we also use their polish, top and base coats. We stock up to-the-minute colours for the season ahead at our Eastbourne salon. Alternatively, choose to have the Shellac or OPI Gel semi-permanent Gel Colour combined with your Pedicure to receive a fully pampering experience. Gel Colour….5 weeks plus of flawless wear, instantly dry and smudge proof with tremendous mirror image shine… all without harming the natural nails. A full description of this treatment can be found by clicking on “Semi Permanent Gel Colour” in the Pedicure Treatments list. For every Pedicure at Jasmines, we use The Belava Indulgence Chair and the award winning Belava Footbath Tubs. These tubs are placed on a base unit which provides a spa-like experience with heat and vibration and are fitted with a disposable Belava Liner that is thrown away after every warm soothing soak. These prevent the spread of bacteria, fungus and other infectious diseases. This is the safest and most sanitary way for you to enjoy a Pedicure. Whether you’ve neglected your feet for too long or just want a delicious treat, this pedicure leaves your feet so smooth you’ll be longing to show them off. Once you’ve experienced this pedicure, you’ll be walking on air. A speedy treat for those hard working feet. Revive tired looking feet and toes with the Jasmine’s Mini Pedicure, designed to make the best of your feet when time is of the essence. This service takes approximately 30 minutes (plus drying time) to leave your toe nails looking professionally finished. Adored by women all over the world, because of its simplicity and the natural look it evokes. A French pedicure gives your nails that clean, well-groomed appearance that is neither flashy nor fussy. A classic and demure finish that never goes out of style. Perfect for young ladies up to the age of 14 who want their feet to look their best. This is the ultimate spa experience for the feet, filled with pampering ingredients. Sit back, take the weight off your feet and be pampered from soul to sole. Paraffin wax heat therapy provides intensive moisture therapy which nourishes very dry skin and cuticles and heels that have a tendency to split. The penetrating heat increases the circulation and leaves skin radiant and healthy looking. It can be applied to the feet as an individual treatment or as part of your pedicure. At Jasmines, we use Hemp Paraffin Wax which is an aromatic skin treatment wax containing Hemp-Seed Oil – a rich source of Omega 2 fatty acids-renowned for aiding in the healing of skin problems and inflammatory conditions. The warm paraffin wax is one of the most effective ways of applying heat to reduce the swelling in muscles, decrease inflammation of rheumatic joints and soothe the pain from arthritis. During the Luxury Classic Pedicure, the feet are submersed into the heated wax and coated with 3-5 layers of wax. The feet are then covered in plastic and placed in warm thermal booties. The paraffin remains on the skin for 10 minutes. Together with a full Luxury Classic Pedicure, this is a deeply relaxing treatment where warm basalt stones are used to relax and soothe your feet during the foot, calf and lower leg massage. This treatment also gives wonderful relief from arthritic conditions and total relaxation for over-worked feet – a truly blissful experience. Please remember to wear open-toed sandals to protect your newly applied lacquer. Calluses are the thickening of the skin caused by repeated friction. This four-stage pain free treatment removes tough calluses immediately leaving your feet feeling soft, refreshed and revitalised. Please click on this treatment in the side bar on the left of this page for a full description.